Faced with severe budget cuts and rising costs to deliver core services, local authorities’ ambitions to invest in smart city technology may seem a distant dream. However, investment in smart street lights will not only provide immediate cost benefits, it can light the path to a smarter city. Well-lit streets can provide a number of benefits to communities, such as helping people to feel safe and secure, discouraging crime and boosting quality of life by providing artificial light, extending ‘light’ hours that can give people more time to do activities and be social. Streetlights also improve safety on our roads, helping to reduce risk to drivers and pedestrians during the evening and at night. However, with more than 7.5 billion streetlights in the UK, all of which require maintenance and upkeep (Highways Term Maintenance Association) they can be a huge drain on local budgets, accounting for around 40 per cent of a local council’s energy bill (APSE State of the market Survey;2017). Because of this, it is important that local authorities look for new, more cost-effective ways to light their towns and cities. LED street lights are considered to be a better alternative to traditional street lighting, offering a longer life span and lower maintenance costs. However, LEDs alone will not be enough to truly see the cost and energy consumption of street lighting reduced. A more intelligent and inter-operable system is needed, and this is where smart street lights could provide the solution. Street lights embedded with smart sensors can detect movement made by pedestrians, cars or bikes - dimming or brightening depending on passing activity, and only providing the right amount of light when it is needed. Connected to a central management system, the smart street lights provide two-way communication between individual lights and the local authority, allowing for changes to be made to scheduling or light intensity. 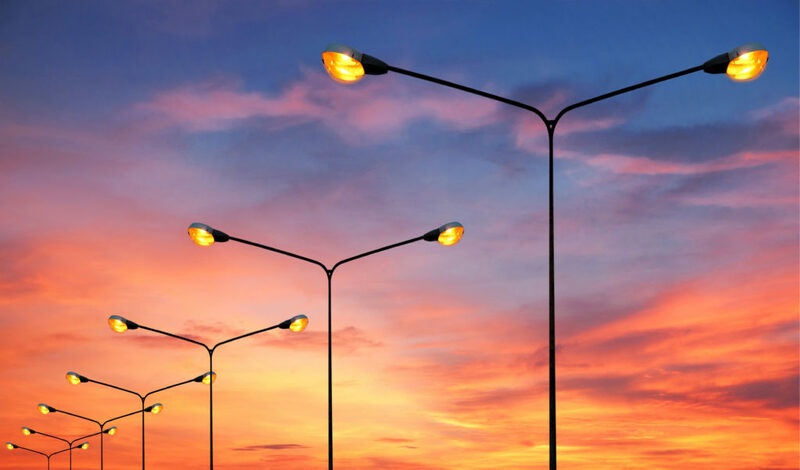 Continuing to provide all the benefits of well lit streets and roads, smart street lights can also notify the local authority about any maintenance issues that arise, by feeding back useful data from the lamp to the central management system. Remote monitoring will provide councils with knowledge of faults or power outages in real time, eliminating the need to perform regular checks and saving time and money that could be utilised elsewhere. This advanced level of monitoring and management means that connected smart street lights have a much longer life span than ‘legacy’ lighting. For example, an LED lamp life span is around 10 to 15 years, up four times longer than the life of traditional street lights (EnGo Planet; 2018). Adapting or replacing street lights will require an initial investment from the local authority and so it is important that councils can demonstrate how smart street lighting can provide real value for money. Giosprite’s smart sensors not only enable local authorities to switch lights on and off but also monitor other things like air quality, traffic and congestion and noise pollution. The combination of enhanced monitoring and reduced energy consumption could see local authorities pay off their initial investment in less than ten years (The Future of Street Lighting – Future Cities Catapult; 2017). Smart street lighting is a rapidly growing industry, yet we are still only at the beginning of realising its full potential. From environmental monitoring, traffic optimisation, smart parking and public safety the humble lamp post could provide local authorities with a backbone to trial and roll out a wide range of smart city projects, ensuring a brighter future for everyone.